Fortunately, for like healthy eating, nutritional balance, and all that boring stuff I do, I did not entirely subsist on chocolate chip banana bread for the past few days — tempting as it may have been. I don’t mean to ridicule the dish. I have fond memories of going to dubious Tex-Mex restaurants with some ridiculous name in high school and college. The kind of places with “artistic” murals that served slushy margaritas in cactus glasses and where you could encounter ketchup in your enchiladas (yup, that happened) and nachos that consisted of bagged tortilla chips covered with shredded cheese and briefly nuked in the microwave. Back then I would always order fajitas because of the build-your-own thing and because the mounds of extras would do a pretty good job at covering the dull pieces of meat, making for some passable fajitas. 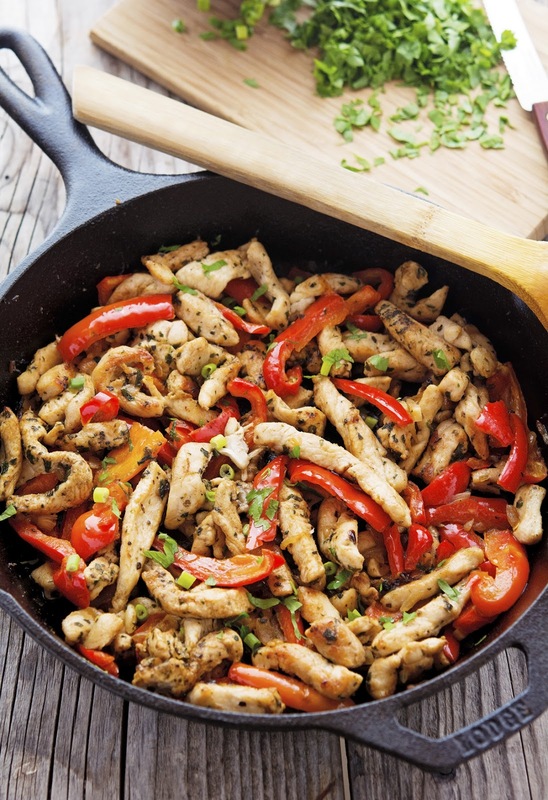 To be honest, I never imagined a scenario where a Skillet Chicken Fajitas would be the only meal I’ve eaten thrice in two days or where I would make my own paleo-friendly cauliflower tortillas, but that for another time. Anyways, I can say without fear of contradiction that I’m a little addicted to this dish and I’m still amazed how easy, quick, and simple this is — making it the perfect weekday night meal. And especially right now, when the days are getting shorter and the decreasing daylight makes us all a bit more depressed a colorful, flavorful, and fun dish is just what we need. Not to mention that it requires only stovetop cooking for all 15 minutes in a single skillet. Now that’s what I call awesomeness. 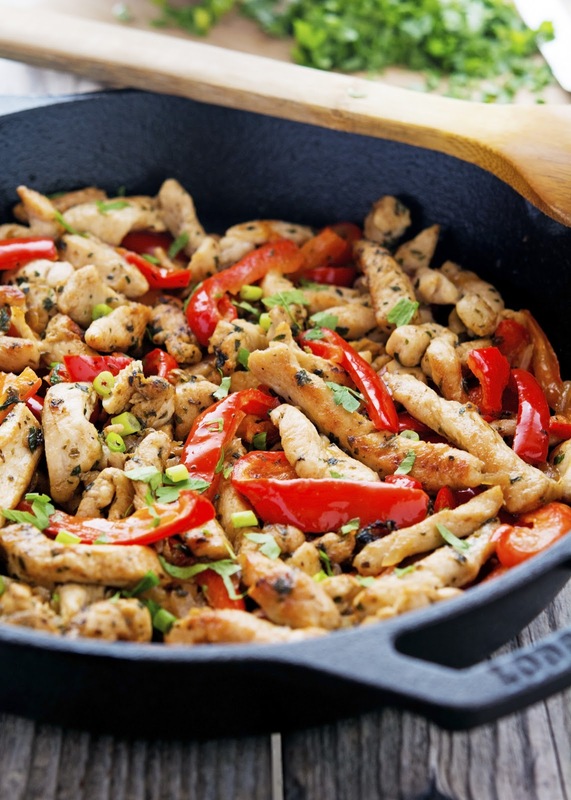 20-Minute Skillet Chicken Fajitas Print this recipe! Add the peppers in a single layer. Try to get them a little charred underneath before you move them around. Once they’ve begun to brown, add sliced onion, and ½ teaspoon of salt. Wait again for some color to develop before you move them. When peppers are nicely charred in spots and onions have softened and sweetened, scrape mixture onto a plate to clear the skillet. Return skillet to the burner and heat remaining 1 tablespoon of olive oil. 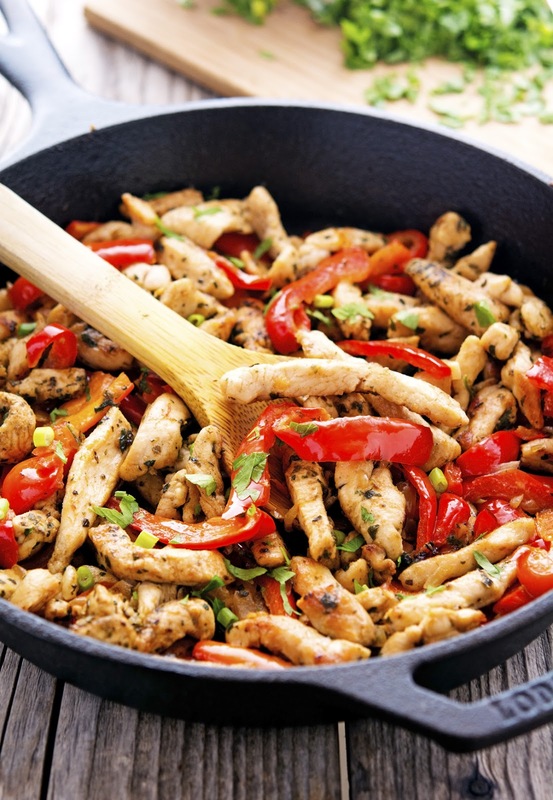 When sizzling, spread chicken strips in as much of a single layer as you can. Wait until they brown underneath to move them. Saute' strips, regularly pausing so that they can get some color, until cooked through, about 6 minutes. Heat again until everything is sizzling. Sprinkle with a bit of chopped fresh cilantro and serve immediately. One serving yields 270 calories, 11 grams of fat, 5 grams of carbs, and 36 grams of protein. As a kid I would always order tacos and enchiladas whenever I went out for Mexican food, but as I got older and more interested in health, fajitas were my item of choice, since they are pretty much the healthiest thing on the menu! I bet these are delicious! Hope you're doing well buddy! I could see how you could be addicted to this dish! I could eat some version of mexican food almost any night of the week. Can't wait to try this! Hi Mike, I've been on a chicken kick myself, love fajitas. Oooh, thank you for sharing! I will definitely try this one night! Mmmm I love me some fajitas! We don't have a Tex-Mex place here and it makes me sad. 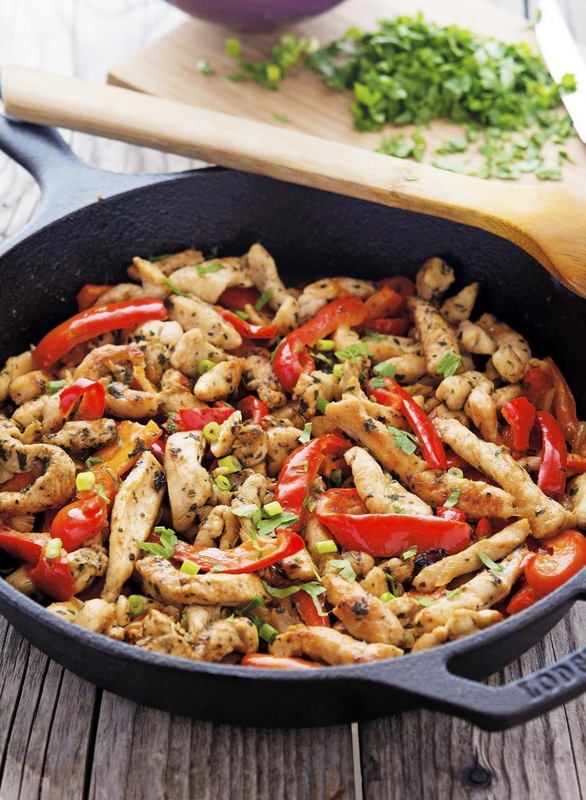 I always ordered fajitas because I loved the sizzling pan they'd bring to the table! And it usually came with guac, which is always a MUST. Yours look like a much more delicious version than my high school days! Happy November! Just letting you know that I featured this recipe in my October 2015 round-up of Deliciously Healthy Low-Carb Recipes. Hope a lot of my readers will click over here and try it! use garlic in it as well. it makes a world of a difference and gives it actual flavor. Hi there! What's the serving size for the calorie count you gave? Thanks! Before I started eating healthy I was a homeless rodeo clown. Now I am a world class magician!